The good news for Tesla, and other automakers investing resources into electric vehicles, is that most Americans (51%) believe electric cars are the future of transportation, while only 34% don’t, according to data from YouGov Profiles. For younger consumers aged 18-34, the level of agreement is even higher: 59% anticipate a future of electric vehicles. While statistics like these should give Tesla an overall sense of optimism, the automaker’s current struggles are starting to harm how consumers view the brand. Amid multiple reports of production delays with its Model 3 sedan – meant to be Tesla’s most affordable vehicle – and a fatal crash along a California highway in late March involving a Tesla Model X operating on autopilot, Tesla’s Buzz score has fallen into negative territory. Asked whether they've heard something positive or negative about Tesla in the past two weeks, US consumers now give Tesla a Buzz score of -1, down from 10 just over a month ago. Other YouGov BrandIndex health metrics, such as Impression and Value, have also decreased for Tesla in recent weeks. 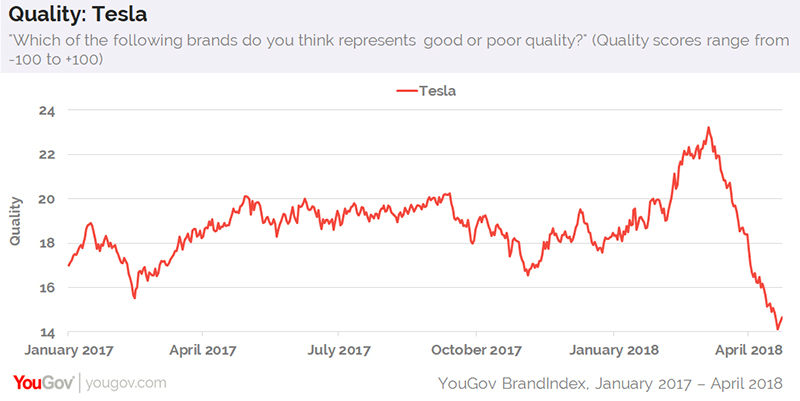 The brand’s Quality score, for example, which asks respondents if they think Tesla represents either good or poor quality, has dropped from 23 in early March to 15, where it sits currently. According to additional data from YouGov Profiles, current and former Tesla owners tend to be men who fall within the 25-44 age range. They're more likely to identify as Democrat than Republican and live in the South than the Northeast. Nearly two-thirds of current and former Tesla owners say they’re often among the first of their friends to try new technology products and services, compared to one-third of the general public who say the same.